All winning films from the International Short Film Festival of Cyprus, including “Lullaby of the butterfly” will be will be screened on Sunday 21st of December 2014 in Nicosia at Ermou 300 at 6pm as part of the SHORT FILM DAY Event. The International short film Festival of Cyprus in collaboration with the Le jour le plus Court (Short Film Day) celebrates the official Short Film Day on the 21st of December with the screening of great new short films in an interesting and non conventional location. During the shortest day of the year, Ermou 300, within the walls of the old town of Nicosia, will host this alternative cinematic event in a Short Film Day Celebration. 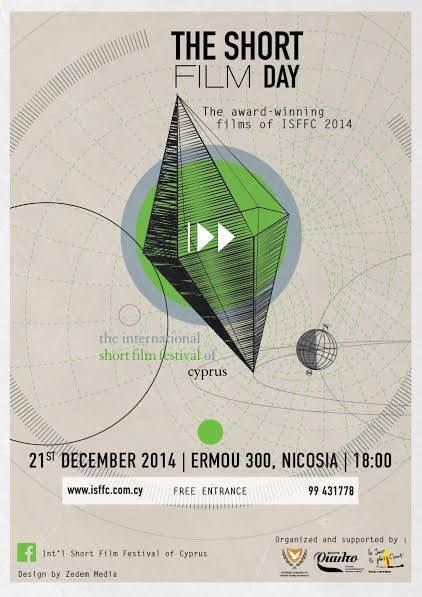 The Nicosia audience will have the opportunity to watch the award winning short films of the ISFFC 2014 competition. The event is organized and supported by the Cultural Services of the Ministry of Education and Culture of Cyprus and the Rialto Theatre. The screenings will be accompanied with drinks and local delicacies.